The Master of Theological Studies (MTS) program, available online or partially on campus, prepares you to participate in theological research, writing, and teaching. 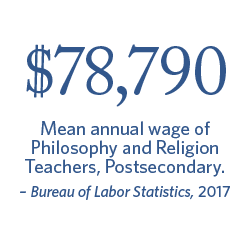 It provides a graduate-level understanding of several theological disciplines and an opportunity to specialize in a concentrated area. Examine contemporary issues in biblical criticism, teachings of the Christian faith and themes related to the Christian life. Increase your understanding of biblical languages, Church history, Christian theology, and the Renewal Movement. Select additional coursework ranging from Paul's writings and parables of Jesus to charismatic Renewal theology. Be mentored by a renowned faculty of scholars and practitioners on campus in Virginia Beach. Basic features of Hebrew and Greek and use of available study aids such as lexicons, concordances, and other exegetical tools. Enables those with little or no prior knowledge of the biblical languages to engage in basic word studies and grammatical exercises. Guided development and refining for writing a master’s thesis through focused reading, scholarly research, building a bibliography, writing a literature review, academic format and protocol. Prerequisites: approved thesis proposal. Pass/No Pass. Developing the thesis proposal from DGEN 697 into an extended, well-written document incorporating critical analysis and synthesis, and involving original work. Follows the timeline and structure of the Thesis Manual to produce a Master’s Thesis of 15,000-20,000 words. Prerequisite: DGEN 697. Pass/No Pass. A continuation for DGEN 699. Repeatable for credit. Prerequisite: an IP in DGEN 699. Pass/No Pass.